Just had a great email from reader Jim Fletcher, who’s a keen metal detecting enthusiast. His contribution is so wonderful, I have little to add – so it’s over to Jim. What a wonderful, fascinating collection. Please Jim, if you’ve any more stuff like this, please do share. This is just amazing. I thought you might be interested to see these mining related items I’ve found while metal detecting around the Brownhills area. 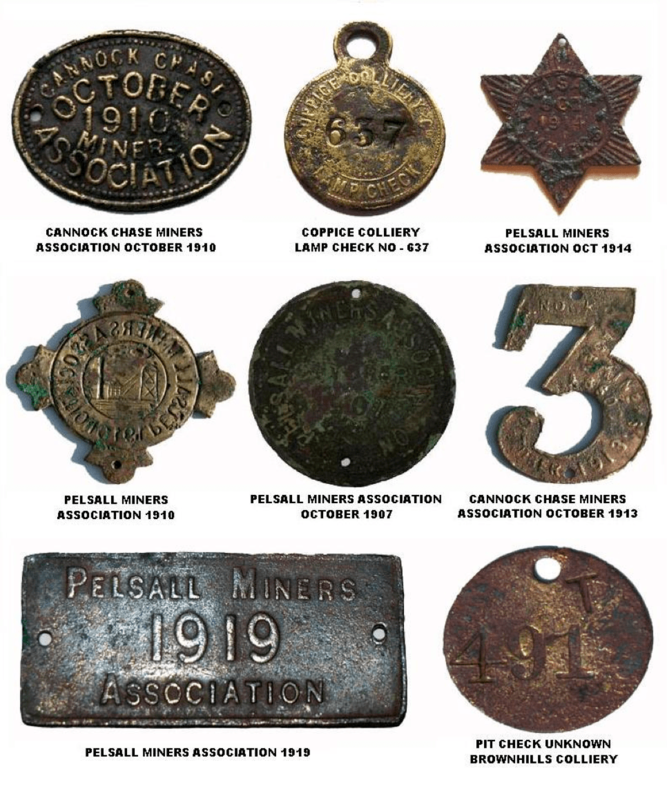 Most of these are miner’s association badges dating from before WW1. 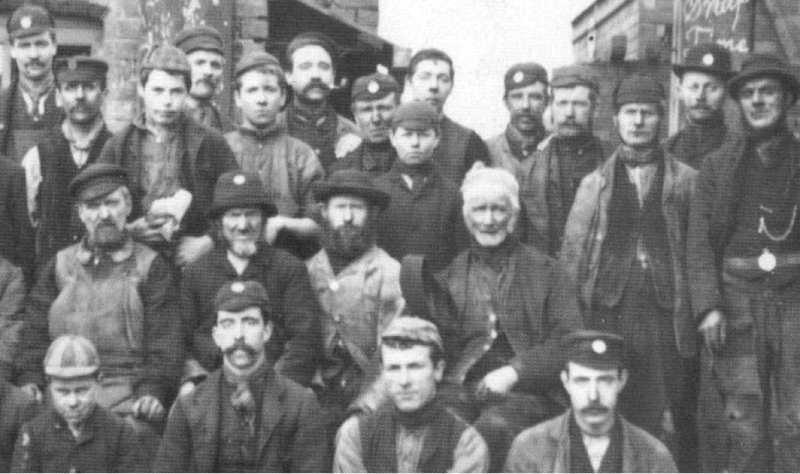 The Coppice Colliery lamp check and the pit check (possibly from the Cathedral Pit) also date from the same era. I usually find the brass ones but this could be due to the better durability of brass rather than the copper ones which seem to deteriorate much faster. A stunning, fascinating array of badges. This entry was posted in Brownhills stuff, Cannock Chase, Environment, Followups, Fun stuff to see and do, Interesting photos, Local History, News, Reader enquiries, Shared media, Shared memories, Social Media, Spotted whilst browsing the web, Walsall community, Walsall Wood stuff and tagged Brownhills, Brownhills common, Brownhills local history, Cannaock Chase Miners Association, Cathederal Pit, Coppice Colliery, Coppice Pit, Jim Fletcher, lamp check, Local History, Metal Detecting, New Photos, Pelsall Miners Association, pit check, tallies, Walsall Wood. Bookmark the permalink. Nice collection Jim, how many of those did you find in Brownhills itself? i used to detect regularly on the old racecourse in Brownhills. I did not realise that it used to be a race course until my grandfather told me. He was a miner in Brownhills. I did find one or two badges while detecting, plus quite a few jettons and tokens, all on the race course. i will have a route around in my detecting finds bag this evening and see what i can find. its such a shame they built the housing estate on the race course before i had a chance to exhaust it of all its hidden gems. All are from brownhills except the one dated 1919 which came from Pelsall itself I’m not sure if there was a Brownhills miners association? I think most would have been members of the Pelsall and the Cannock chase associations. These are really the only objects I’ve found that have a direct link to the local history of brownhills although I’m sure there must be tokens etc. Don’t know if anyone can help. my mom found a miners association badge in her garden some years ago. its got a number “0161” on it (don’t know if this means anything. She would be interested to find out more about it, she lives in Coppice Lane, Brownhills. Please email me . Thanks for your time.